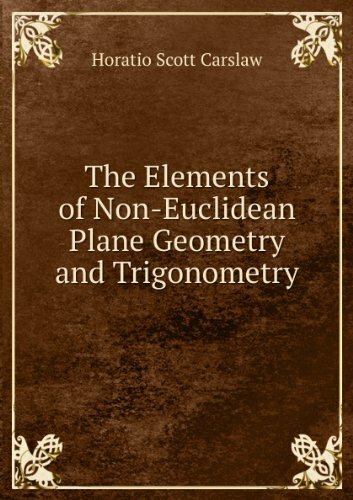 In this little book the author has attempted to treat the Elements of Non-Euclidean Plane Geometry and Trigonometry in such a way as to prove useful to teachers of Elementary Geometry in schools and colleges. Hyperbolic and elliptic geometry are covered. This text develops non-Euclidean geometry and geometry on surfaces at a level appropriate for undergraduate students who completed a multivariable calculus course and are ready to practice habits of thought needed in advanced undergraduate courses. by John William Withers - Open Court Publishing Co. Chapters include: Foundation For Metrical Geometry In A Limited Region; Congruent Transformations; Introduction Of Trigonometric Formulae; Analytic Formulae; Consistency And Significance Of The Axioms; Geometric And Analytic Extension Of Space; etc. This book gives a simple and direct account of the Non-Euclidean Geometry, and one which presupposes but little knowledge of Mathematics. The entire book can be read by one who has taken the mathematical courses commonly given in our colleges.